To Homosexualist Romney: Its Not Just The Economy:, & we are Not Stupid! | RabbiLevin.com - Fighting for Morality! To Homosexualist Romney: Its Not Just The Economy:, & we are Not Stupid! 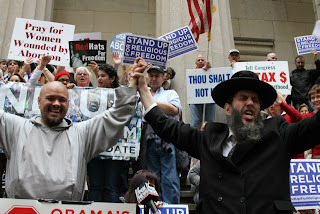 Rabbi Yehuda Levin calls out Romney as a dangerous homosexualist whose record of 15 years shows an unceasing support for the entire homosexual agenda including domestic partnership which is defacto homosexual marriage. Levin calls Romney the political godfather of homosexual marriage ; who because he 'piously " masquerades as a conservative 7 religious family man while constantly advancing the entire gamut of the radical anti-religious anti family agenda, is actually more dangerous than Obama and should be passed over at the ballot box !